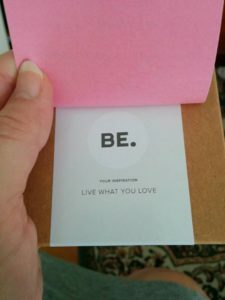 I ordered a couple of gifts from the lovely Be. 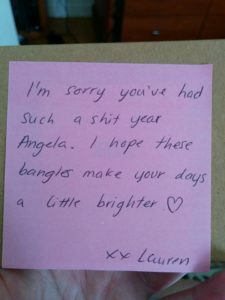 Bangles for Christmas – imagine my delight to find a lovely little message when they arrived! So, go and throw them some love and money (although not in a manner that will offend morality laws); not only are they awesome, the business helps push some good things back out into the world, like education for girls. As with all shopping experiences, check the sizing guide before you order! This entry was posted in News and tagged Be. Bangles, education, good things, jewellery, One Girl. Bookmark the permalink.